Sunrisers Hyderabad (SRH) vs Chennai Super Kings (CSK) will be playing the 33rd match of the 12th season of the Indian Premier League - IPL 2019 on 17th April 2019 at Rajiv Gandhi International Cricket Stadium, Hyderabad. As far as weather is concerned, it will be warm natch hours with the temperature around 30 °C. It's a balanced surface. There is a little bit of grass, but it's mostly dry. To be honest, there were a few cracks visible, so it should play slow one feels. Dew may make batting easier. Sunrisers Hyderabad are 6th on the points at with 6 points in 7 matches; 3 wins and 4 loss. Chennai Super Kings are table topper with 14 points; winning 7 matches of 8 played. Sunrisers Hyderabad will be bringing back Yusuf Pathan and Siddharth Kaul in place of Ricky Bhui and Sandeep Sharma. Probable Playing XI for SRH: Kane Williamson (c), David Warner, Jonny Bairstow (wk), Vijay Shankar, Yusuf Pathan, Deepak Hooda, Abhishek Sharma, Rashid Khan, Bhuvneshwar Kumar, Khaleel Ahmed, Siddharth Kaul. Chennai Super Kings are likely to play with the same winning combination.. Probable Playing XI for CSK: MS Dhoni (c & wk), Shane Watson, Faf du Plessis, Suresh Raina, Ambati Rayudu, Kedar Jadhav, Ravindra Jadeja, Mitchell Santner, Imran Tahir, Deepak Chahar, Shardul Thakur. Chennai Super Kings (CSK) and Sunrisers Hyderabad (SRH) have played 10 matches against each other in Indian Premier League (IPL). In 10 IPL matches, Chennai Super Kings have won 8 matches and Sunrisers Hyderabad have won only 2 matches. Chennai Super Kings and Sunrisers Hyderabad have met four times in IPL 2018 and all the four matches were won by Chennai Super Kings including the IPL 2018 Final. 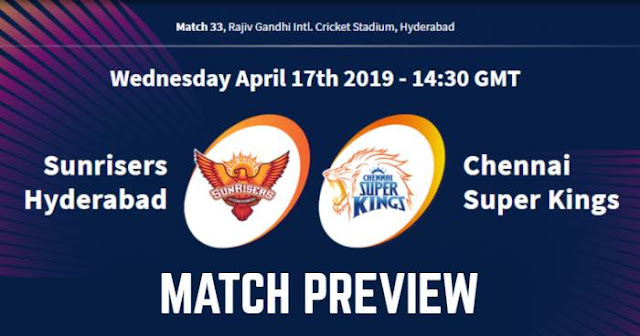 Sunrisers Hyderabad and Chennai Super Kings have played 3 times in IPL at Rajiv Gandhi International Cricket Stadium, Hyderabad; out of which Chennai Super Kings won twice and Sunrisers Hyderabad won only once. The Chennai Super Kings and Sunrisers Hyderabad have the two most-economical spin bowling attacks in IPL 2019; the overall economy rate of CSK’s spinners this season is 6.15, while SRH’s spinners’ economy rate is 6.60. 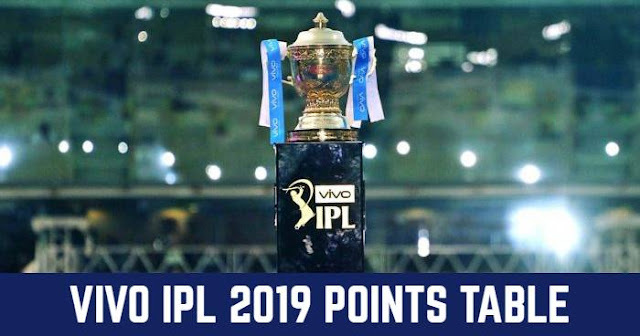 Sunrisers Hyderabad have the best scoring rate in the Powerplay overs – 8.33 and Chennai Super Kings (6.22) have the poorest scoring rate in the powerplay overs in IPL 2019. David Warner needs 21 runs to complete 3000 runs for Sunrisers Hyderabad in the IPL.